If a player at any point in the turn fulfills the requirements of a milestone card, he is immediately awarded that milestone card. Most milestones give benefits. These benefits take effect immediately. You must apply the benefit for the rest of the game, even if it is not helpful. Other players can claim the same milestone provided that they do so during the same turn. Occasionally there may not be enough milestones cards; please make a proxy copy to hand out in that case. In phase 7 of each turn, all remaining milestone cards that have been claimed at least once are taken out of the game and can no longer be claimed by other players. Milestones are very important in the game and it is vital to plan your strategy around them. This milestone is awarded when you place a billboard campaign on the map. You no longer pay salaries for marketeers (campaign manager, brand manager, brand director). It is not allowed to pay salaries voluntarily. When you place a marketing campaign, it remains on the board forever. To indicate this, place the campaign tile on its eternal side on the board with a single wooden piece on it. The corresponding marketeer card will be unavailable for the rest of the game. It will not be returned to the stock or the player's hand. 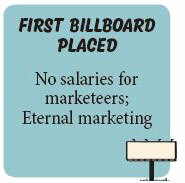 This rule already applies to the billboard you place to get the milestone. 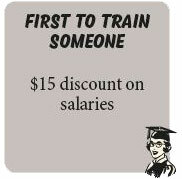 This milestone is awarded when you train an employee to a higher level. For the rest of the game, you will receive a $15 discount on salary costs. Salary costs can never go below $0. Using the discount is obligatory; you may not voluntarily pay salaries. This milestone is awarded when you hire three people or more in the same turn. You immediately receive 2 management trainee cards that are placed on the beach. If you have active training capacity, you may immediately train these cards as recruitment happens before training. In the unlikely case that there are not enough management trainee cards left, you receive whatever is left. 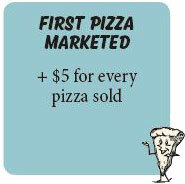 These milestones are awarded when you place a marketing campaign that advertises burgers/pizza/any type of drink, respectively. For the rest of the game, that chain receives a bonus for being the "Home of the original burger/pizza/drink". 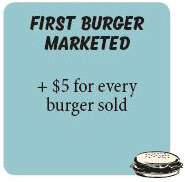 Whenever it sells a burger/ pizza/drink, it gets an additional $5 bonus. This bonus does not affect the unit price. This means it has no influence on the inhabitants' decisions on where to eat; and it is not doubled by gardens. Like all income, however, it can be boosted by a CFO. In the case of drinks, the bonus counts for all drinks, not just the type originally marketed. This milestone is awarded when you play an errand boy in your structure. It is not awarded for errand boys on the beach. 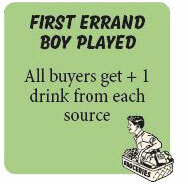 For the rest of the game, your buyers (errand boys, cart operators, truck drivers, and zeppelin pilots) get 1 extra drink per source they encounter. So, errand boys will get 2 (identical) drinks of any type. Cart opera- tors and zeppelin pilots will gather 3 drinks for each drink symbol they pass, and truck drivers will receive 4. This bonus applies to the errand boy played to get the milestone. This milestone is awarded if you have $20 cash at any time (in practice this means after getting income and before paying out salaries). You may look at the face down reserve cards. You are allowed to make truthful or confusing noises about whatever you see on the cards. Ho- wever, you may not show them to other players. These milestones are awarded when you produce a burger/pizza, respectively. You immediately receive a burger cook/ pizza cook card. 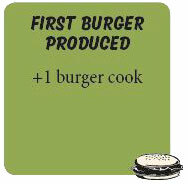 As this milestone is awarded during production, you may not train the burger cook, as training occurs before production. If there are no more cook cards of the correct type, you receive nothing. The cook will require a salary in the Payday phase. If you do not want to pay her, you may fire the cook instead. This milestone is awarded when you play a waitress in your structure. It is not awarded for waitresses on the beach. 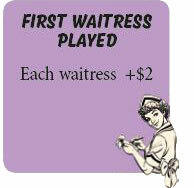 For the rest of the game, you will receive $5 for each waitress in your structure rather than $3. This bonus already applies to the waitress played to get the milestone. This milestone is awarded when you throw away at least one food or drink token in phase 7 (Cleanup). For the rest of the game, this milestone card functions as a freezer. You may store up to 10 tokens (food and/or drink) in the freezer during phase 7. These items may be sold in subsequent turns. 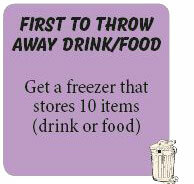 Items can be kept in the freezer for as long as you want. 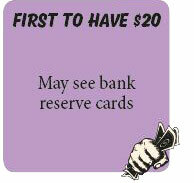 If you have more than 10 tokens, you may freely choose which ones to keep and which ones to discard. You may not yet store anything in the freezer in the turn in which you receive this milestone. This milestone is awarded when you play a pricing manager or a dis- count manager into your structure, thereby lowering your prices. For the rest of the game, your prices will automatically be $1 lower. For instance, they will be $9 if you play no price related managers. You cannot undo this effect. 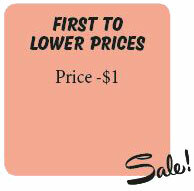 This takes effect immediately, so your prices will already be $1 lower in the turn in which you first lowered prices. 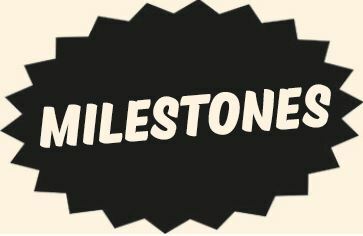 This milestone is awarded when you place the first cart operator into your structure. It is not awarded for cart operators on the beach. For the rest of the game, your cart operators, truck drivers and zeppelin pilots will have +1 range. 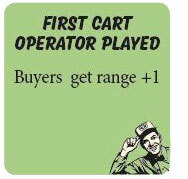 This takes effect immediately, so your first cart operator will already have a range of 3. 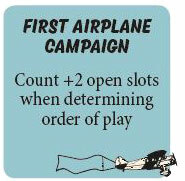 This milestone is awarded when you place an airplane campaign. For the rest of the game, when determining order of play, you add 2 extra open slots. These slots cannot be used to play managers or other employees, they are just a bonus when determining the order of play. This milestone is awarded when you place a radio campaign. For the rest of the game, if you have a radio campaign running in phase 6: place 2 goods of the type advertised on each of the houses reached by the radio. If the house is already full, place 0 or 1 goods, depending on how much advertising the house will still take. You may not choose to market 1 instead of 2 goods. 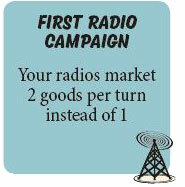 Your radio will market the same good twice, it cannot market two different goods. This takes effect immediately, so in phase 6 of the turn in which the milestone is achieved. This milestone is awarded if you have $100 or more in cash at the end of phase 4. Your CEO gets the ability to also do the work of a CFO. This gives a 50% cash bonus at the end of phase 4 (dinnertime). 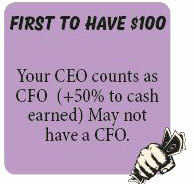 You do not get a CFO card. If you already have a CFO card, you must fire the CFO in phase 5 of this turn. You may not train a CFO anymore after you have achieved this milestone. The new ability takes effect only from the next turn onward, as you can get it only after phase 4 has just ended. This milestone is awarded if you have to pay $20 or more in salaries in phase 5. These salaries have to be actually paid out- you may not count salaries that are covered by a discount. Note that you have to use all discounts still available to you at the start of phase 5. You may not voluntarily pay more salaries than you have to. (Of course, you may use a recruiting manager or HR director to hire an employee in phase 2 so her salary discounts are no longer available in phase 5). 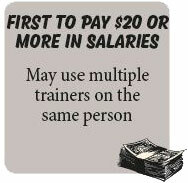 For the rest of the game, you may use training actions provided by multiple employees to train the same person. 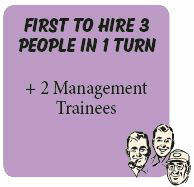 For instance, with 2 trainers and a coach, you could now train a management trainee up to an executive vice president in one turn.